The afrobeats artist’s ebullient personality shines through in the food-themed visual. On her 2016 album Mama Africa, Nigerian afrobeats artist Yemi Alade explores sounds from all over her continent, but the video for its latest single “Tumbum” sticks closer to home. In a riff on the food-themed lyrics of the song, Alade plays a restaurant cook who serves up tasty jollof and fufu in a rural Nigerian community. With a playful storyline starring Nollywood luminaries Ime Bishop Umoh and Beverly Osu, it’s a hilarious accompaniment to the Selebobo-produced track. As part of a Q&A with The FADER — live on the site today — Alade explained the importance of the theme. "In Nigeria, food isn’t just for consumption but is a cultural representation. Different states in the country are known for their indigenous delicacies." 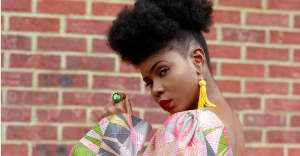 Read an interview with Yemi Alade about her hustle to become the queen of afrobeats.